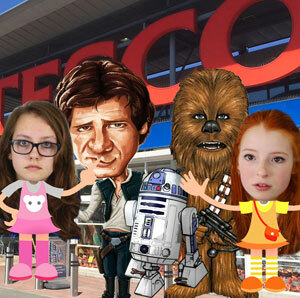 When we were in the Tesco's car park recently, we noticed some strange characters lurking by the entrance and then realised that some of the Star Wars cast were there on a shopping trip. First we saw R2D2 and Chewbecca outside, and then we managed to grab a few words with actual cartoon Han Solo, who was shopping for avacodos so that he could make some yummy guacamole. He's obviously a fan of Dr. Jean as well. Han Solo wasn't exactly in a good mood though, and Liv didn't help improve things when she told him that she didn't know what the Millennium Falcon was. But who's that over there, I think he's someone important. I kind of recognise him. And what do you do in Star Wars Han Solo? The... what? What did you say? No, sorry Han Solo, Liv's never watched Star Wars. OK, bye Han Solo. Thanks for your time anyway.